On Monday 4th February our Ulster Scots after school club started. We really enjoyed learning about the Lambeg Drum. 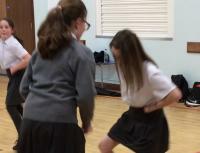 This week at our Ulster Scots Club we all had a lot of fun learning how to do Highland Dancing. This week at Ulster Scots Club we enjoyed learning about the bag pipes.